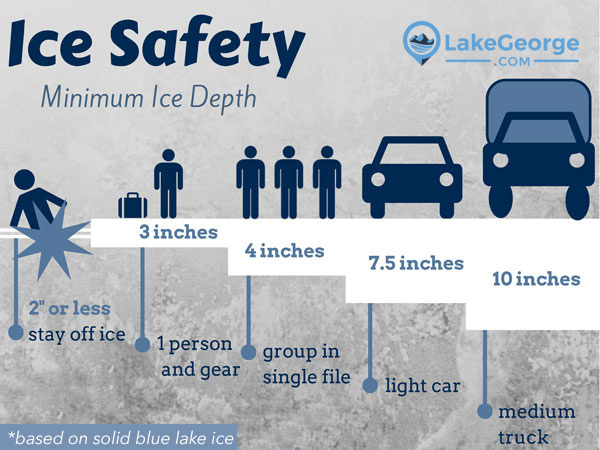 Ice safety information is important knowledge to have in Lake George, especially during the late fall freeze and the spring thaw. Whether you're walking out on the lake for some ice fishing, pulling up in a snowmobile, or trying your hand at ice skating, you should know the basics. Take a look at the infographics below to better visualize safe and unsafe ice. Ice thickness is never uniform on any body of water, making it hard to judge the safety of the area. Running water, including the areas of lakes where streams, spillways, and dams are present, are often tricky areas. If you keep in mind that ice will never be completely safe, you'll be prepared for suddenly dangerous situations. 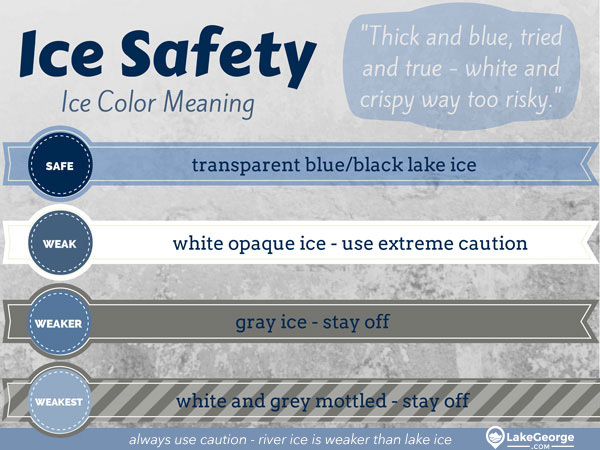 Share these infographics with your friends on Facebook or Pinterest to help spread awareness about ice safety in Lake George.